I have never met a scalloped potato I liked (other than the kind that come from a box- blush) until I modified a recipe from Simply Recipes recently for a date night at home. It was a-mazing. It wasn’t quite as simple as this but it didn’t take long at all and hubby and I both loved it. That sounds so good! I’m a big fan of simple in the kitchen! ooooooooooooooooh this IS cream scalloped potatoes. I thought you meant creamED scalloped potatoes… like creamed corn lol. My vote? Cheesy salsa enchiladas. Do you use heavy whipping cream or half and half? I use heavy whipping cream. Half and half might work, but the cream really makes a nice thick “sauce” for the potatoes. I vote for the butterscotch bars. I make our “scalloped” potatoes the same way, only I grease the pan with bacon grease first. I know, not so healthy, but oh so delicious! Butterscotch bars would be nice to see next time! Thanks for sending this recipe our way. I will be trying it soon! This is SO funny because my husband actually likes those boxed “au gratin” potatoes and I hate them, kids don’t eat them much either. I had a box on hand due to it being free after coupon, so I made it last night and dh was the only one to eat it lol. And loved it. *sigh*. This is great, because I can cook this instead of those boxed kind. This sounds like a recipe I would like to try. We have oodles of potatoes and I buy whole raw milk so I usually have cream on hand. I love easy recipes! Thank you… I’m switching up our menu this week to include this! Yum. Easy and Yum. My favorite recipes! We love scalloped potatoes at our house and we really enjoyed this recipe. I switched it up a little last night and added ham steaks, fresh mushrooms and onions to the recipe and it was so good. Here is a version we have at our house. Of course I don’t typically measure, so this is one of thos “by taste” type recipes. You can add ham to this to make it a meal (with a fresh salad or veggie on the side) or omit the meat to make it a side dish. Put 3/4th of potato mixture into pan, add diced ham if desired(I use leftover ham for this) then top with remaining potatoes. Pour liquid over potatoes then use more whipping cream to cover until all potatos have moisture around them. Bake 350 degrees covered for 1-2 hours (depends on how full the pan is) until potatoes are tender. Uncover during the last 15 minutes to allow top to brown. Remove from oven and garnish. They can be frozen, but they don’t look very nice once defrosted and reheated. Frozen potatoes tend to get pretty mushy. I try the cream scalloped potatoes, they were the best. Thank you for sharing that recipes. I also made the pizza pockets. Love them. And I love your site. I,m trying to make more home-made food. Thank you again for sharing. God Bless. These, as you said are amazing. I do have another scalloped potato recipe but it usually takes me up to 40 mins depending on the amount of interruptions. Yesterday we came home from the creek at 4 and using the food processor they were in the oven by 4:05! 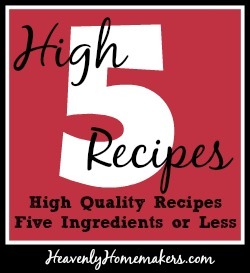 I love your five in five recipes! I feel so stupid asking this, BUT….when you say cream, what exactly do you mean? Sour cream? When I use “cream” in a recipe, I’m referring to what is generally known as “heavy whipping cream”, found in the dairy section at the grocery store. I usually use the raw cream that I can skim off the top of our milk – but if I don’t have any of that available, I buy regular cream from the store. I would say that although it’s not called “sweet cream” at the store, it is sweet, especially compared to sour cream. I love these potatoes! Last night I made them with sweet potatoes and they turned out great!!! Wow! Sooooooo yummy! This pregnant mama is finally satisfied! Love how easy, too! Thank you for another great recipe! I wonder if you could make these in the crock pot? My husband pastors a church and I frequently need side dishes to use in my crock pot for Sunday afternoon meals. Has anyone tried these in the crock pot? I haven’t tried it but I am sure that would work just fine! I would try it on low for 3-4 hours and see how it goes. Great idea! I made this tonight, and I am IN LOVE! This is not only the easiest scalloped potato recipe I’ve ever made, but the tastiest and the healthiest. Thank you so much! It will definitely be on the permanent rotation!